The Coug: Best Bar in the Palouse. Like so many others, the McGregor family came to the rolling hills of the Palouse more than a century ago. They raised sheep and started growing wheat, and set up headquarters in Hooper, Wash., beside the Palouse River. The next generation worked with researchers at what was then Washington State College to find new ways to preserve the fertile dryland soil, and while not farmers exactly, the family business has now grown to be the largest independent fertilizer, agri-chemical and equipment company in the Pacific Northwest. When the company celebrated its 125th anniversary in Hooper several years ago, five generations were in attendance. If you work for the Inlander and visit the Palouse, you often get asked whether the McGregors who founded and own the Inlander are related to the McGregor family of the Palouse. They're not, but it shows how much recognition the name holds in the region. The McGregor Company's story is a fitting one for the Palouse, a region home to two land-grant universities and characterized by a combination of tradition and innovation. It's evident in the responses that the readers who voted for the Best of the Palouse are true residents — and that makes it easier for a visitor to act like a local with limited time. Start with coffee or a snack at the Daily Grind on Main Street, voted Best Palouse Coffee Shop, and plan to sit for a while at one of the eclectic tables and chairs among the students, Bible-study groups and gatherings of retired faculty who come in for caffeine and conversation. The company, which also includes three local drive-through shops, changed ownership last year — but Dana Dykes, who took over with his wife, Tami, says they knew better than to fix what wasn't broken. "We haven't taken anything away," he says. "We've just improved what was there." Follow the students up the hill to the Washington State University campus, where Frank Hill — readers' choice for Best Professor — has been attending or teaching classes for almost three decades. Known among his students as a passionate, entertaining storyteller and a baseball fanatic, he's known more widely around campus for wearing shorts year-round. Stop by The Coug on Colorado Street for a lunchtime burger and a pint before the right-by-campus place voted Best Palouse Bar fills up with students for the evening. Open since 1932, it's an institution that's outlasted many a wild group of 21-year-olds, as well as their impromptu reunions years later as alumni back for a game. 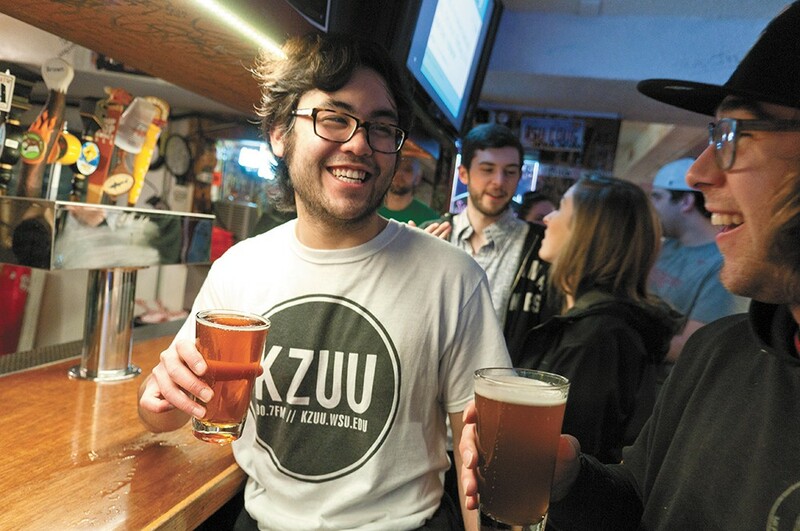 Students vie for a spot in the mug club, which lasts for life — the Coug will go get mugs out of storage if alumni call ahead to say they'll be in town. Later on, head over to the South Fork Public House, named after the south fork of the nearby Palouse Water Basin. Its owners grew up in Pullman, and it's quickly become a favorite with families and year-round residents since opening at the beginning of 2010. General manager Bob James says the most popular menu item is the mac and cheese — made with Cougar Gold, naturally — but his personal favorite is the prime rib sandwich. Ingredients are sourced locally as much as possible, including beer from Spokane and Washington wines with connections to WSU through the Wines by Cougars network. Sit on the back patio that runs right up against grassy hills, and appreciate the places where there's space for new ideas to coexist with the tried and true.